We also require that the lastest HubSpot tracking code be correctly installed in Volusion. The final thing we need is API access to retrieve orders and send the data into HubSpot. Details on each permission are shown below in a table copied directly from Volusion. The permissions we need are highlighted in orange. By default, your store has a primary administrator account – known as the Super Admin – which is typically assigned Customer ID #1 within your Customers database table. The Super Admin has access to every portion of your store. Products Ability to view/edit Products, Options, Option Categories, Warehouses, and In-Stock Requests. Product_Keys Ability to view/edit Product Keys and Product Key Distribution. Discounts Ability to view/edit Coupons / Discounts. GiftCards Ability to view/edit Gift Certificates. Customers Ability to view/edit Customers Accounts (non-Administrator accounts), including customer passwords. This Access Key is also a prerequisite for the following Access Keys: CRM System, Accounts, Administrators, Affiliates,and LoginAsCustomer. LoginAsCustomer Ability to login as a customer. Reviews Ability to view/edit Customer Reviews. Affiliates Ability to view/edit Affiliates (system settings) and Affiliate Stats. ConfigSetup Ability to view/edit Config Variables, Company, SEO and Product Display Settings. PaymentMethods Ability to view/edit settings on the Payment page. This Access Key is also a prerequisite for the Credit / Debit Cards Access Key. Vendors Ability to view/edit Vendors. POs Ability to view/edit Purchase Orders. 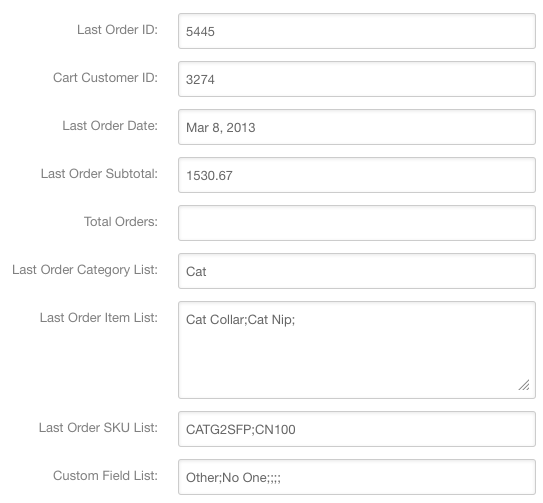 Orders Ability to view/edit Orders, Phone Orders, Recurring Billing, Returns / RMAs andAbandoned/Live Carts. Allows the use of the Point of Sale system. This Access Key is also a prerequisite for the Credit / Debit Cards Access Key. Credit / Debit Cards Ability to view/complete Credit / Debit Card / eCheck details of an Order. Note that due to PCI/CISP compliance regulations, no administrator will ever have access to view a customer's full credit card number. Articles Ability to view/edit articles (Site Content) and the Knowledge Base. Newsletters Ability to view/edit Newsletters. 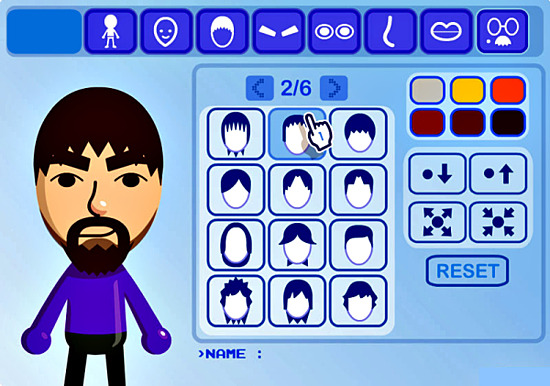 Categories Ability to view/edit Categories (including subcategories). Specials Ability to view/edit Nav Menu Promotions. Import Ability to use Data Import tool. Export Ability to use Data Export tool. This Access Key is also a prerequisite for theAPI Access Key. AdminHistory Ability to view Admin History table. File Editor Ability to view/edit Templates, Custom Fields, IP Firewall and File Editor. TheFile Editor give access to change website colors and edit HTML and CSS files. This Access Key is also a prerequisite for the BrandingImages (Logos) Access Key. Inventory Ability to prepare shipments and receiving at Receiving and view/edit Search Terms. ShippingMethods Ability to view/edit/test Shipping Methods in Shipping. This Access Key is also a prerequisite for the Locations Access Key. Locations Ability to view/edit Locations (Edit Countries/States/Provices in Shipping) andCurrency. Tax Ability to view/edit tax rates and settings in Tax. ROITracker Ability to view/edit ROI Tracking. StoreStats Ability to view/generate reports at Reporting and view graphs/statistics on theDashboard. WebsiteDesign Ability to view/edit styles and settings in Navigation Menu. BrandingImages Ability to view/edit Logos. Maintenance Ability to open/close the store and use tools in Maintenance. Administrators Ability to create/edit Administrators and update Access Keys. Note that having the Access Key of Customers gives you the ability to view theAdministrators table, but you will not have the ability to open or edit any records until this Administrators Access Key is checked. Volusion Social Ability to post from the Social page. Deal of the Day Ability to create/edit deals in Deal of the Day. Social Store Ability to modify settings in Social Store. CRM Manager Ability to create/edit settings at CRM System. API Ability to access/use Volusion API tools. My Rewards Ability to modify settings at MyRewards. Release Notes Ability to view Release Notes. A buyer persona is a detailed profile of an example buyer that represents the real audience – an archetype of the target buyer. Marketers can use buyer personas to clarify the goals, concerns, preferences and decision process that are most relevant to their prospective customers. Your buyer persona is the representation of your prospects. Being sensible to the wants and needs of your potential customers and clients will give you the opportunity to give them better service. By knowing your buyer persona, you can render your prospects with the best marketing experience by offering them the right products and services at the right time. Imagine how effective marketers could be if we would all stop making stuff up and start aligning our messages and programs with the way real buyers think. In creating your buyer persona, you’ll need to gather the general information of name, age, gender, profession and financial situation that will give you background information to establish which category this persona would fall into. This information will begin to tell you what your buyer persona prioritizes, thus helping you understand what influences their buying decision. Their profession and financial situation will tell you how fast they can decide on buying your products and services and how capable they are of purchasing them. The next thing you’ll want to do is understand your persona’s demographics and characteristics. The demographics shows your buyer persona’s social standing and the characteristics will tell you what kind of products and services this persona would commonly purchase. With that in mind, you’ll need to gather information on their purpose, education, free time, buying decision and /shopping habits. Knowing how well your buyer persona understands the products and services your company offers, and the purpose of the product to them, will give you the idea on how you can market your products and services effectively. Address specific people. When you know your buyer, you can talk to him/her directly. You don’t have to say, “you” when you can say, “25-year old man, living in the suburbs”. Address specific problems. Talking about a specific problem is more engaging than a general problem. But it only works if you address a problem your buyers have, so you need to know your buyer personas first. Pinpoint accurate placement. Placement is a key to effective marketing. When you understand your buyer personas, you know where they are, and how to reach them at the right time. Showcasing the right price range. If you market a product a buyer cannot afford, they won’t buy it. And they’ll be left with a belief that you’re over priced for them. Also, by knowing your buyer persona you can address particular people with distinct problems and different beliefs. Most buyers want a more personal relationship with you the company. You have the responsibility to give them that feeling of importance and value as a customer and client, while helping you establish a stronger, trusted and honest relationship with your prospects and buyers. Your marketing campaigns will be more successful through better buyer personas. Write content that is relatable by understanding the wants and needs of your prospects through your buyer personas. By posting content that is relevant and purposeful for them, you’ll generate loyal customers. HubSpot 3 provides some great new features, and HubSync users may want to get a head start. We are considering some HubSync upgrades to better use the new Contacts functions. But, we won't be able to roll these out until HubSpot completes their migration (The latest estimate is February, 2013). In the meantime, here are some things you can do. HubSync sends relevant data from orders into HubSpot. However, HubSpot won't let you use the data to build Smart Lists unless you do a few more steps. You have to lookup your portal ID and enter it after the "=" sign. This will bring up the old HubSpot leads screen. Pick one of the leads submitted by HubSync. You can tell because the Event will be set to Completed Purchase, Abandoned Cart, or Admin Purchase. Then, click View Full Lead Details > on the lower right. 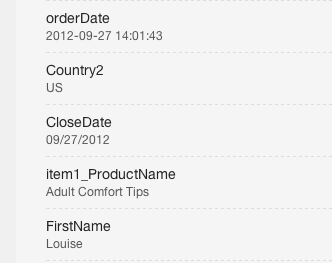 Notice that for this order, Louise bought some Adult Comfort Tips. Now, here's what you can do to better use this information in the new Contacts area of HubSpot 3. Go back to the main Contacts screen. Look for Manage Settings on the lower right. Click the Blue Create Property button. Then copy the name of the data from the old leads form. For example, you might want to make a new property called item1_ProductName to hold the data for the first product purchased. Normally, you can just leave these in the Contact Information group, and leave the input set to Single Line Text. An easy way to do this is to have two tabs open in your browser — One for the new Contacts settings and another for the old Leads form data. Then, you can just cut and paste the names. 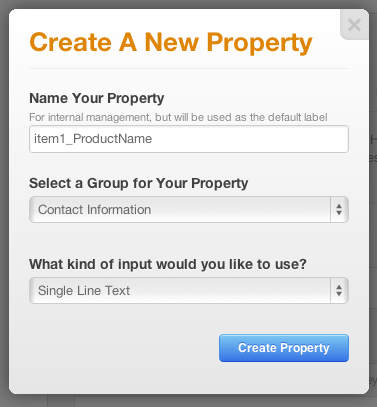 Now the new property is available to build Smart Lists and for other HubSpot 3 features! This all works well for a lot of situations. Still, there are some limitations in HubSpot 3, and there's been some discussion about this on the HubSpot developer list lately. There is currently no way to add multiple orders to HubSpot. So, if you have customers who make second and third purchases, item1_ProductName will contain the first item the customer last purchased. There is no way to have a complete history. We have some ideas for how to address this situation, but it is a difficult problem. For a given order, we do submit data for multiple items purchased in a single order. You may see item1, item2, item3, etc. It's just that with a repeat order any new data will replace the old. I hope this helps! If you have ideas or requests, please leave a comment.